in the mountains, in the sunshine. as you start to descend to the tree line. as you walk gently downwards. a little brook, not far away. and on this rock, there sits a child. where all is beauty, safety and love. and so you smile and wave. quite what to do with you. you are holding in your loving and creative hands. and watching you with focus and with concentration. Copyright Silvia Hartmann 2009. All Rights Reserved. 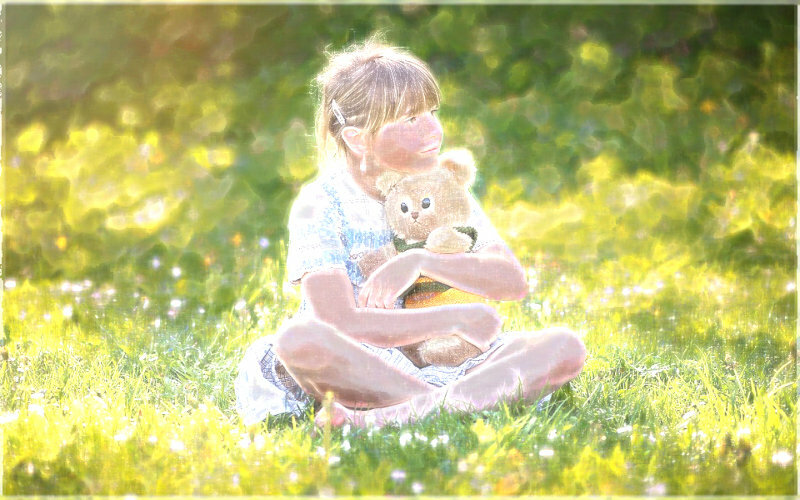 The Inner Child Meditation "Child In The Meadow" by Silvia Hartmann is now available as a quality MP3 download from https://dragonrising.com/store/hypnospecials/inner_child_healing/.